...to enable them to communicate with the military’s Mobile User Objective System (MUOS) satellite communications system. This MUOS channel upgrade, comprising a field-replaceable power amplifier and supporting software, will allow secure voice and data communication with the MUOS system. The order is valued at $5 million; the kits will be delivered in the fall of 2013. The two-channel PRC-155 Manpack radio also runs the essential waveforms from the defense department library. They include the Soldier Radio Waveform (SRW) that connects dismounted soldiers to the network, the Wideband Networking Waveform (WNW) that seamlessly transports large amounts of data and the legacy SINCGARS waveform for communication with existing radios. 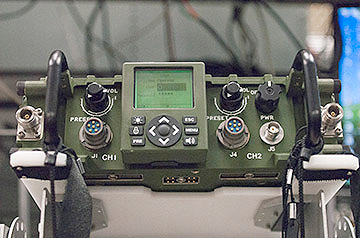 Using the PRC-155’s two-channel capability, soldiers operating on any one of these waveforms on one channel, can interconnect with soldiers using another waveform on the second channel. With the MUOS capability in the PRC-155, a network of soldiers can be interconnected with others in a far distant location. The MUOS waveform, based on the communications interface found in commercial cellular networks, will deliver high-speed voice and data communications and 10-times greater capacity than the military’s current Ultra High Frequency (UHF) satellite communications system. With a smartphone-like flow of information, the upgraded PRC-155 radios will allow soldiers to access the MUOS communications system wherever they are deployed, on foot or from land vehicles, ships, submarines and aircraft.